You can't complete your Kris Kringle costume without this Deluxe Santa Belt! Every other Santy-poser will be wearing a plain black belt/brass buckle combo while they jingle their bells and take pictures with smiling children but you'll do better. This Deluxe Belt has the same design as the one Mrs. Claus hand-crafted for her jolly husband! A beautiful green and red pattern with a shiny gold trim will encircle you when you buckle this belt around your waist. Whether you've got donations to gather or a mall of children waiting to meet Father Christmas, or even a simple costume party coming up, this Deluxe Santa Belt is a must have for your Saint Nick disguise! You may want to also take a peek at the rest of our amazing accessories: boots, suspenders, beard/stache sets. 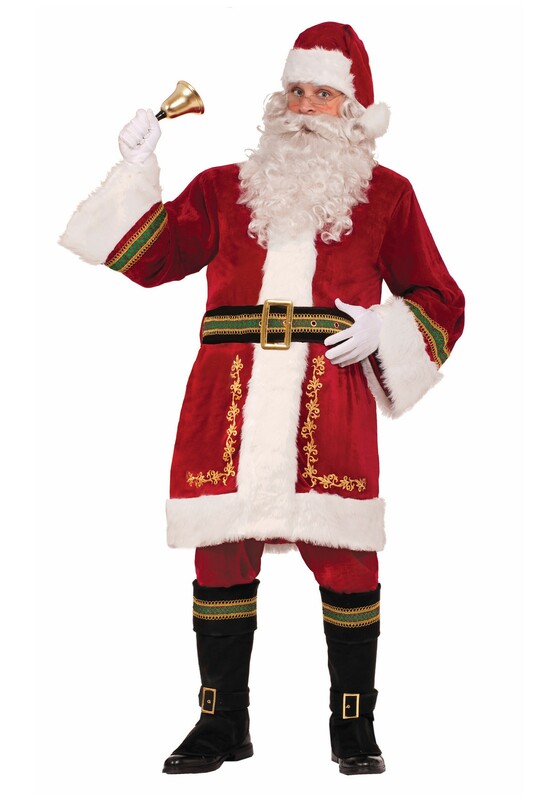 Add the perfect ones to your costume and you'll be the most convincing Santa Clause walking the snowy streets! Just don't be surprised if everyone starts acting suspiciously kind around you... They may just be trying to move their names from your Naughty List to the Nice List before Christmas hits!